Among Jo Newton's many outstanding achievements - including winning the leadership category of the Victorian Young Achiever Awards, Dairy Research Foundation Emerging Scientist Award and Royal Agricultural Society of Victoria Emerging Leaders Award - is an accomplishment that could easily go unnoticed in her crowded resume. Fresh from being named a Young Farming Champion, Jo was still studying for her PhD at UNE and working part-time on a nearby Merino stud when she set about resurrecting the sheep section at the Armidale Show. She put up her hand to become chief steward and promptly incorporated new genetic tools into the junior judging criteria. "As a school student, local agricultural shows helped open my eyes to agriculture’s exciting opportunities, and the same is true today,” she says. Jo has volunteered as a steward at the Sydney Royal Easter Show and Australian Sheep and Wool Show since then, but her commitment to the Armidale Show neatly encapsulates this accomplished scientist's unbridled passion for agriculture, her innovative thinking and belief in nurturing the next generation. Not to mention her hard-working ethos. Jo's professional life is hectic these days, helping show dairy farmers the link between herd improvement, genetics and farm profit as a research scientist with the Gardiner Foundation-initiated project ImProving Herds. “I’m passionate about ensuring that research outcomes don’t just reside in scientific journals," she says. However, Jo still manages to find time to advocate for young people as chair of the Youth Voices Leadership Team, to speak at schools and events promoting STEM and careers in agriculture, and to volunteer at agricultural shows. 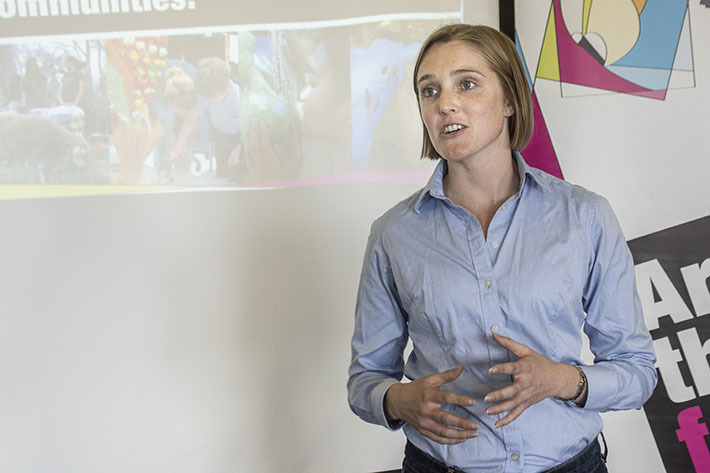 "I'm particularly keen to support young women entering agriculture; it's a passion that was fostered at UNE, when I helped to initiate the Farming Futures Project (which connects agricultural graduates with prospective employers) and represented Australia at the Enactus World Cup in Mexico," she says. In 2018 and at the tender age of 29, Jo was named one of The Australian Financial Review's 100 Women of Influence. But she's never been one to rest on her laurels. An Endeavour Postdoctoral Research Fellowship will soon take Jo to Ireland to learn from leading animal geneticists and extension specialists. "I'm keen to understand more about how I can translate research into practical, tangible outcomes, to deliver benefits to farmers," she says. And all this from a woman who grew up in inner-city Melbourne, who was told at age 16 that she was "too smart to study agriculture".